There’s no question that in this day and age, a huge part of your marketing strategy is digital. Consumers and businesses are almost always connected to the Web, and you will want to be able to reach them with your marketing strategy. For many businesses, this may seem like a daunting task as the digital landscape is ever evolving. If you are looking to have a successful digital marketing strategy, it all comes down to how you manage each of your digital marketing campaigns. What is the difference? Here’s what you need to know about the difference between digital marketing strategies and digital marketing campaigns, and how you can create the best ones for your business. Before creating the right digital marketing plan for your business, it is important to understand the difference between digital strategy and digital marketing campaigns. A digital marketing strategy is a series of actions that will help you achieve your goals using online marketing tools. Building such a strategy does not need to be overly complicated. It is simply a plan of action to achieve your desired goal, or multiple goals. If you are trying to generate more leads through your web site this year, you will need to make adjustments to your plans so that you can achieve that goal. It may be confusing to understand the difference between digital strategy and digital marketing campaigns, so here’s a way to distinguish the two. Digital marketing campaigns are the building blocks or actions within your overall strategy that guide you to your goal. Even if a campaign takes several years to run, that still does not make it a strategy. 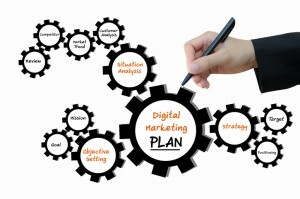 It is more of a tactic that works along other campaigns to form your overall digital strategy. Now that you have an understanding of the difference between these terms, here’s what you need to know so you can build your strategy. Before you can begin creating digital marketing campaigns to boost your digital strategy, you should set your objectives. The first step is to define your business as an overall mission, and it must fit into your grand plan. You can ask yourself questions such as, “What is the overriding objective you want your digital marketing efforts to achieve?” The answer to that question is your mission. You should also set and measure your key performance indicators (KPIs). Get specific by figuring out which figures you will be accountable for achieving. Analyze your previous digital marketing efforts first so that you can strive for a positive increase in your results and set reasonable expectations. Find out how you are going to measure each of these KPIs and figure out which ones matter the most to your CEO. Before creating a new strategy, it is important to draw from your past experiences. By looking back at your past successes and failures, you can focus on setting the best KPIs for your business. Think about a time period that you want to analyze, and make sure it is the same length of the time as your new strategy. You can analyze a month, a quarter, or a year. You can use tools such as Google’s benchmarking reports in your analytics to compare your progress to that of your competitors’, and you can also analyze their strategy. Make sure you analyze every aspect of your strategy, even areas you have not thought of before. By examining what went right and what went wrong last time, you can optimize your new strategy for a higher success rate. Using the right tools and technology can be very beneficial to your marketing program. You can use simple, low-cost tools like Squarespace for your web site and MailChimp for e-mail marketing. If you have a larger demand, or a company with more experience, consider using an integrated platform such as Marketo or HubSpot. As your business grows and you become more skilled, it will be fairly easy to upgrade to more efficient technology. It is important to remember that your plan will never be perfect from the beginning. Every assumption you make in the beginning may have to be adjusted along the way. Keep this in mind as you move forward with your campaigns. Although you have taken every measure to create a carefully constructed plan based on your insightful analysis, you still cannot predict how customers will respond to it. This is why it’s essential to keep measuring and monitoring the performance of your digital marketing strategy, and change elements whenever it is necessary. The more flexible you can be with your strategy, the easier this will be for you. Page media refers to any channel that you invest money into to grab the attention of your potential buyers. These may include tools like Google AdWords, paid social media posts, or native advertising such as sponsored posts on other web sites. You can use all of these together in your digital marketing strategy to reach your goal. For example, if you have a landing page on your web site that is meant to help you generate leads, you can use your channels to make that post shareable so that others can distribute it through their own social media profiles to their network. This can increase traffic to your landing page so that you gain more leads. Developing the right digital marketing strategy can make a huge difference for your business, so choosing the right marketing and advertising agency in Toronto is crucial. 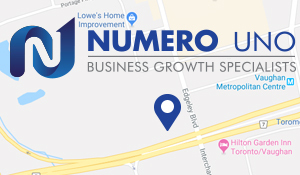 At Numero Uno Web Solutions, we provide our clients with many marketing solutions such as web site SEO services, ORM strategy development, content audit services, online reputation management, Web design and development, and more. We are a content and search engine marketing agency in Toronto that specializes in helping small to medium-sized businesses improve their web sites. For years, we have helped clients across the Greater Toronto Area, Texas, Massachusetts, and Florida boost their marketing strategies and grow their businesses. Call us at 1-855-SEO-XPRT to learn more about the services and expertise we provide at our Vaughan location.